I started writing this last night, but I was in too much pain to finish it. I awoke groggily, the remains of the midnight dose of Percocet trying to talk me into staying in bed. I forced myself into the shower. I had cooking to do. Ok, a bit of background here. Although I love to cook, I have no interest in cooking as an arts and crafts project. Feta-stuffed dates is about as fussy as I’ll get preparing food. Omelets are fussy: they require 2 pans, and if you don’t flip them just right (I never do) they look terrible. Therefore I make frittatas instead. You don’t need a recipe for a frittata. (However, if you want a great sounding recipe, check out today’s Mark’s Daily Apple) Use whatever veggies, cheese and meat you have handy. It’s a great use for small portions of leftovers. I do recommend using a small amount of chopped onion no matter what else you add. 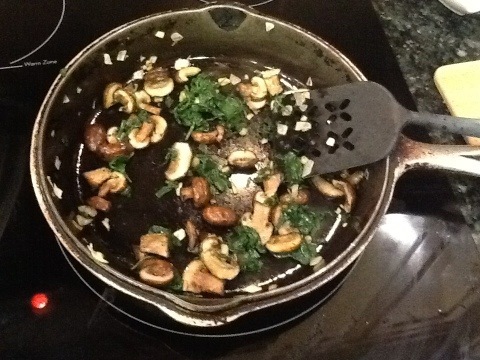 Oh, and a cast-iron skillet is a must! Sauté the onion in olive oil over low heat. 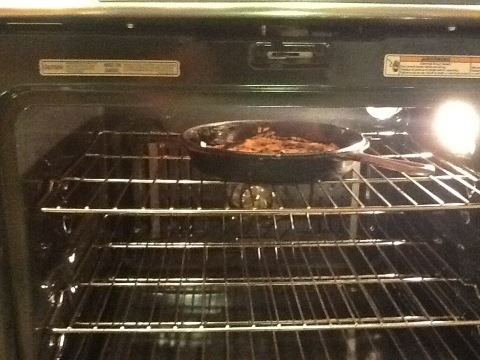 Place an oven rack as high as will accommodate your skillet and preheat the oven on low broil. 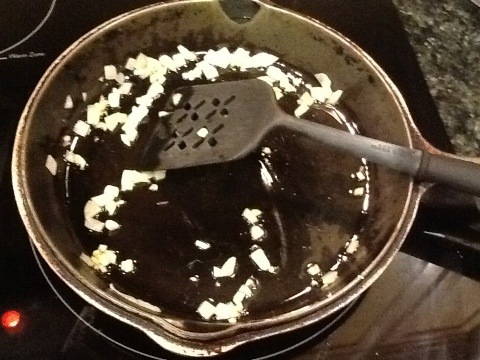 When onion is golden, add chopped garlic if desired. 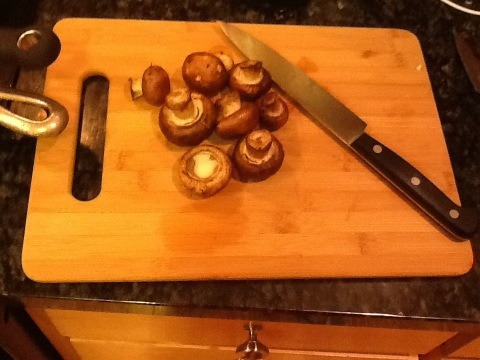 I sliced these baby portobello mushrooms and added them to the skillet. Next I added some leftover steamed spinach. You could also use raw spinach. 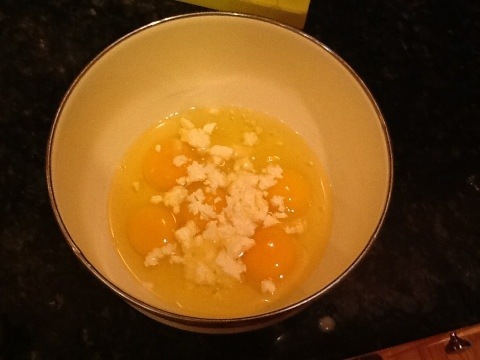 If you want to use cheese, grate it or crumble it into the eggs. I used feta this time. 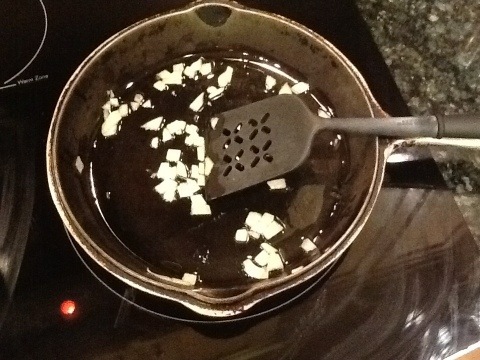 Pour the egg and cheese mixture into the skillet, increase heat to med or med-low depending on your stove. Let cook until the edges start to solidify. Then pick up the edges with a spatula and tilt the pan so some of the liquid mixture on top goes to the bottom of the pan. 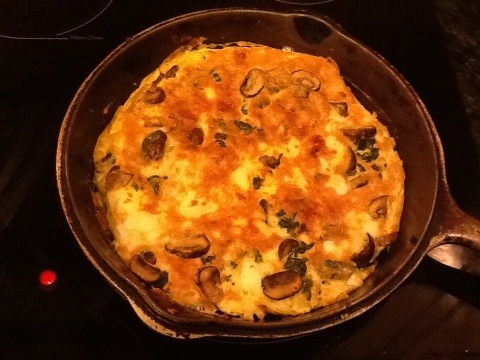 When the frittata is mostly solid but the top is still wet, place skillet in oven for 1-2 min. If you want to add tomatoes, place the tomato slices on top now. 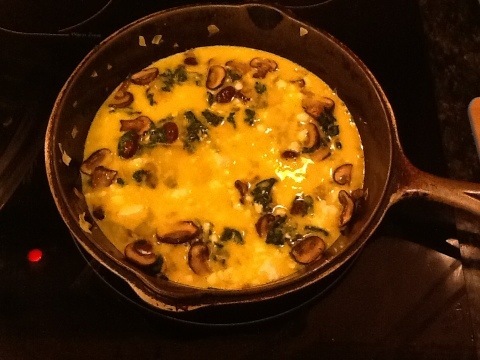 The frittata will puff up and brown in the oven. Friday’s breakfast. 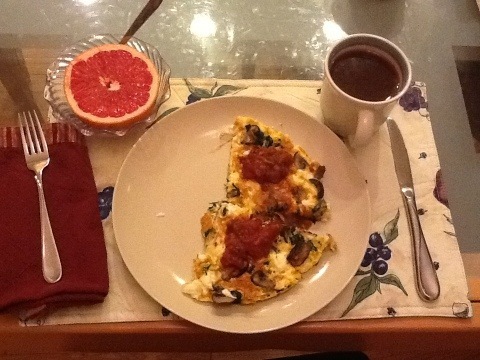 I topped my frittata with salsa. Avocado slices are good too, but I didn’t have any. Comments: We had a delicious, healthy, Primal-friendly meal! I wish I had remembered to take a picture of it! We ate baked salmon, sautéed asparagus, creamed spinach and a salad with homemade balsamic vinaigrette dressing. I enjoyed a glass of red wine but passed on dessert. Comments: unable to work out related to severe back pain all day. Activity: a slow-paced 30min walk on my lunch break. Activity: at least every 30min I got up and walked around the office for a few minutes, checked the fax machine & printer, did my dishes, etc. Hardest part: I was in severe back pain all day, so I didn’t really want to move around. Best part: Making myself move around is probably better for back though it didn’t seem to help. Comments: In order to accomplish this, I set the timer on my phone for 30 min each time I sat down.